The Aviator chronicles the career and downfall of Howard Hughes. For a brief period, he was dating Hollywood Starlet Katherine Hepburn (Cate Blanchett), who managed to ease the symptoms of his worsening obsessive-compulsive disorder. Still regarded as an important cultural icon and the epitome of the “modern woman” in the 20th century, Katherine Hepburn deviated from traditional gender roles by shunning marriage, dating younger men, playing sports, and wearing trousers before it was fashionable or acceptable to do so. 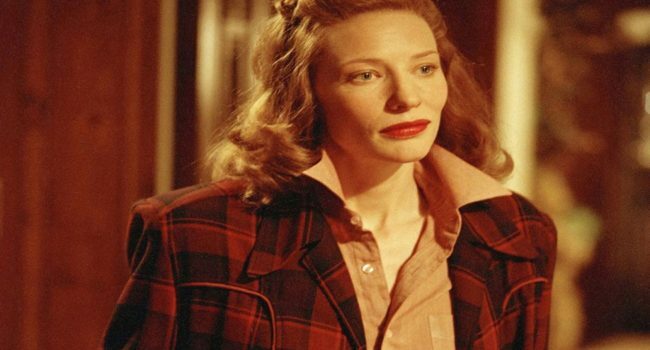 The film takes place between the 1920’s and the 1940’s, but her fashion is comprised of over-sized menswear in bold colors and patterns. 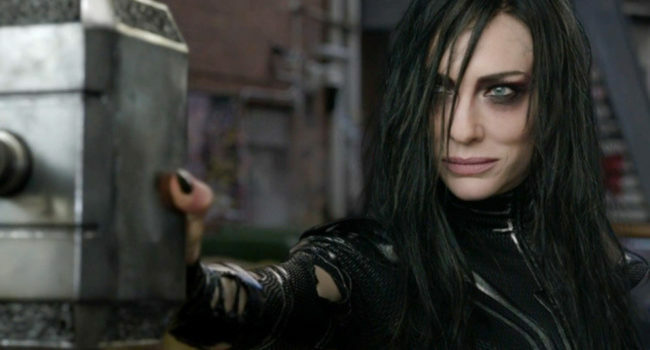 As the secret eldest child of Odin, and sister to Thor and Loki, Hela (Cate Blanchett) was the Asgardian Goddess of Death and former Executioner. After gaining too much power, her father defeated her in battle and sent her to be imprisoned in Hel for millenia. At Odin’s death, the power that held her captive faded and she was able to escape and exact her revenge. She is the villain of Thor: Ragnarok. Granmamare (voiced by Yuki Amami in Japan, and Cate Blanchett in the American release) is not only the Goddess of Mercy and the Queen of the Ocean, but she is also the mother of Ponyo in the 2008 Studio Ghibli film “Ponyo on the Cliff by the Sea.” She can change size at will, often enormous but occasionally the size of a human in order to interact with other beings. Her blousy blue dress is reminiscent of the sea.